Is your child younger than two years old? Has your child ever caught a glimpse of your household television set in the “on” mode? Congratulations: you’re raising a loser. THAT is a highly sensationalized version of what the American Academy of Pediatrics now says, which is that kids under two should not be watching TV, period. What part of “period” do you not understand, Al Bundy? It’s right here on the internet’s leading parenting advice site, Gawker.com: no TV for your babies. Let’s see, all American parents are awful failures wiling to sacrifice their children’s well being at the altar of “shut up so I can relax for five damn minutes.” Got it. Fortunately, you’re all so ambitious for your children that you’ll ruin them in a totally different way by the time they reach high school. Ah, well. They couldn’t have afforded college anyhow. 1. He is 5 and not 2 or younger. 2. I don’t get so hung up about children watching television as so many others do. I do believe in balance and the importance of children spending time outdoors but at 7 am in the morning, a few minutes watching cartoons in the morning, while I have some coffee, it a good way to wake up for both of us. Also, it is a great time to snuggle on the couch. A few years from now and that reality is long gone. Recently, I was doing some research on the latest trends in neuroscience in preparation for a training for social workers and mental health professionals on how to work with children that have been traumatized. A particular area of interest for me is the teenage brain. It is one of the most rapidy changing period of brain development. This is no surprise to parents who are trying to understand the rapidly changing personality of the teenager. Perhaps the most dramatic area of development is the area called the prefrontal orbital brain. It is called this because it sits directly behind our eyeballs and it is responsible for abstract thought, moral reasoning, self-control, planning, judgement and so many other areas commonly associated with adults. This area is in constant flux, causing radical shifts in mood and attitude. This formation and reformation of the brain continues into young adulthood (mid 20’s). I often joke with parents that while their child has the hardware upgrade, the software has not yet been installed. This is why the teen is capable of getting pregnant, driving a car or doing alegebra but they doesn’t mean that they are completely ready for the adult world of intense responsibilty or raising a family. W = Remember that your child is still “wondering” about how the world works. He or she might try to convince you that they already know how it does but they don’t. They haven’t had enough experience yet for this to be possible. They need you to help them by asking “what if” questions that will explain some cause and effect relationship and assist them in planning out their day and making better judgements. Because their brain is still developing they use their “will” to fight you and cover up their inexperience. Don’t shame them. Train the “will” to find positive rewards in daily interactions. “Wait” for them to get it. It will take them longer than you as they haven’t traveled some of this morally sticky situations in life yet. Allow them a little more time to “wake” up to a new world of responsibilities and schedules. O = Be “open” to “opportunities” with your teenage child to share some wisdom about the world and how to survive in it. Don’t preach at them as this will shut them down completely. “Occupy” the same space and look for openings when you are both in a good mood. The relational approach will be more effective and allow more “objective” conversation between you. Remember that “obedieance” at this age is really about natural consequences or trial and error for the teenager. The will learn more about doing then lecturing. Being a good role model will help them understand how to use the “operators” manual called their brain more than lots of words at this time of life. R = “Relationship” is one of the toughest things to have with the teen but one of the most important tasks a parent can do for their child. You may only have a split-second when the door is open wide enough to have that former intimacy but use it when you can. It will pay huge ‘rewards” for both of you later in life. “Recognize” that the teen is in process. They are still not fully cooked and need more time in the oven of life before they can be expected to make better decisions. They will “reflect” their peers and “respond” more from other unexperienced teenagers over their own, more experience parents. This is not a true sign of dis”respect” or “rejection.” The teen is just trying to find their own way. Don’t take this personal. “Rebelliousness” is the other side of the “readiness” coin of maturity. K = Be “kind” to your teen as they develop mentally, socially, emotionally, physically and spiritually. Turn the proverbial other cheek and smile when they growl. Reach out again when they slap away your hand. The “key” to relating to the teenager is long term vision. This isn’t just about today. It is about the next 10, 20, 30, 40 years of your life together. The cold response you get from the teen child today will “kindle” into a stronger fire of connection later in life. Work with that end in mind. Keep in mind this is your “kin.” They may be more like you than you care to admit. They share your nature and your nurture and need your “kudo’s” for every positive effort and end result you can give. A: Attachment is about creating a bond with those you love. It requires that you accept life’s imperfections and get okay with things being “good enough.” When you have a good attachment with the ones you love almost any obstacle can be overcome. T: Touch is a very important part of being attached. If you’re not getting enough, talk with your mate about it. Physical connection is a necessary part of creating a healthy attachment. If you don’t want or need to be touched, that’s okay, but if your partner isn’t on the same page, it will chip away at your foundation. T: Thoughtfulness means that, even in times of strife, you somehow always manage to consider your partner first. You need to want your partner to be happy, and thinking about him or her should make you happy. A: Affirming verbally how you feel is very important for many people. To never hear “I love you” from your mate can leave you feeling as though you are not truly wanted. Many men and women need to hear they are valued. This is a case where actions do not speak louder than words. C: Connecting with your partner by looking into his or her eyes, holding hands, and just saying “thank you for being in my life” or holding each other tightly for several minutes are both powerful tools. Give them a shot. H: Hoping for a better tomorrow is critical for relationships that are in healing mode. If you both honestly commit to working on your relationship together, you will have the best chance of getting through a rough patch. M: Memories of happier times will help you find the strength you need to get things back on track if you have lost your feelings of attachment. Knowing that you were once in love can give you the motivation you need to find it again. E: Emotional availability and support are the cornerstones of a loving intimate relationship. Your partner needs to know that you’re going to be there for him or her. N: Needing another person is not a sign of weakness. Yes, people can be too needy, and insecure behavior can make it difficult for a couple to bond appropriately. But everyone needs to feel valued and that his or her feelings won’t be dismissed. T: Trusting that you are loved is essential. If you have any doubts, it’s best to sit down and talk about them. Communicating, verbally and nonverbally, is the best tool for creating what you want. After a little time, what you may find is that your partner isn’t perfect and neither are you. Of course, that means that your relationship isn’t perfect either. It is, however, good enough. Ron Huxley’s Additions: As a family therapist, parenting educator and parents, I welcome any movements toward building strong families. It is what the Parenting Toolbox web site has always been about. These 10 tools give some great advice on how to establish the building blocks of relationships. It is actually based on some serious science but that isn’t important here. Practice these parenting tools today. 2. Set up a take-a-break space. 3. Get on your knees. 6. Say their name first. 7. Let them swap chores. 8. Let them make the rules. 9. Give them a piece of the rock. 10. Do a countdown to liftoff. As an empty nester, your relationship with your grown children may be filled with joy or disappointment. Do you act like best friends and weekly phone conversations, go on weekly shopping trips or seek one another’s advice? Or is their life like adolescence all over again? Frustration ferments with questionable choices in dating lifestyles, drug and alcohol consumption and spending habits. Sure, your kids may need to grow up. But consider this: Maybe you are the impetus of the conflict. The fights increase because you have saddled unrealistic expectations on them; maybe they don’t follow the career path you have set for them; maybe they make choices you wouldn’t make. If any of these ring to a familiar tone, it is time to examine the source of your conflict. Always tell the truth to one another. Be sensitive to each other’s feelings. Respect one another, despite differences in opinions. Do not hold on to the past or judge their decisions. We all make mistakes, and each slip-up provides an opportunity for a life lesson. Don’t blame one another. Blame is not always necessary and it’s often unhelpful. 1 Clarke, Preston, Raksin, and Bengston, “Types of conflicts and tensions between older parents and adult children,” The Gerontologist, 39(3) (1999), 261-270. 2 Carol Kuykendall, Give Them Wings (Wheaton, Illinois: Tyndale House Publishers, 1994). 3 K.B. Mims, “They’re all grown up but I’m still a parent!,” Family Information Services, Minneapolis, MN (1998). 4 Chuck Colson, “The Return of Peter Pan,” Breakpoint (July 23, 1992), 5. Copyright © 2006 Lindsey Rich. Used with permission. All rights reserved. Ron Huxley’s Reflections: As an empty nester myself, I found this a simple, but helpful article on how to maintain a relationship with your adult child. I find that the toughest thing to do is allow them to make their own decisions and know when to keep you mouth shut or when to speak out. I admit, I haven’t always managed this balance. Ron Huxley’s Comments: In this video, actress Goldie Hawn talks about the importance of teaching children mindfulness. Her program is called MindUp and takes only a few minutes a day. Mindfulness research is promising huge improvements in mental health. Some of it gets, well, a bit out there! For the most part, however, it holds great benefits in improving mood, increases focus, and promote self-control. What child doesn’t need that? What parent doesn’t need that? Ron Huxley’s Review: The author of this article does a nice job of explaining the scope of anxiety disorders in children and some practical ideas for parents to help their child cope. I like practical tools! One additional strategy I would like to add is the area of sensory diet experiences. 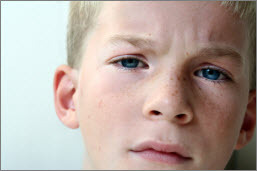 Many children with classic diagnoses have sensory issues that manifest as “defensiveness” or “seeking” behaviors. In the case of the former, children react negatively to sights, sounds, textures, etc. that feel overwhelming. In the case of the latter, children have a graving for sensations. Both types cause disruptions at schools and home and are often misunderstood. Consequently, inappropriate interventions are used to manage the behaviors.